There's a Cold War between the Imperialists and Socialists, and the race to nuke the moon is on. You know, just for the hell of it. As a member of a neutral spy agency called C.O.U.N.T.E.R., you're pitted against both sides of the conflict in CounterSpy, a side-scrolling game that combines stealth and cover shooting. I had a blast sneaking and sniping my way through its opening stages, but after that the game devolves into a mediocre shooting gallery. It's a stylish title that starts on the right foot, but then stumbles when the going gets rough. The plot is ridiculous--your end goal is to launch a missile that will detonate all Imperialist and Socialist nukes simultaneously en route to the moon before impact. The over-the-top quest is peppered with deadpan humor between missions, but the look and sound of things are what stand out in CounterSpy's excellent presentation. The game kicks off with a Saul Bass-esque title sequence, and the rest is decorated with a swing soundtrack and film-grain filter that feels straight out of the 60s. The cel-shaded visuals finish off an undeniably nifty aesthetic. 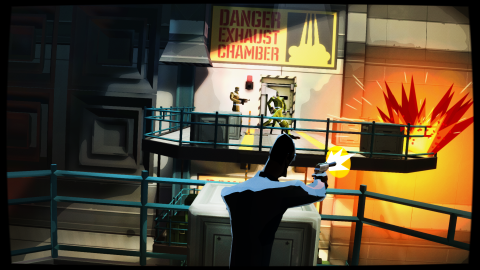 CounterSpy's combination of stealth and cover-shooting is initially fun, but quickly loses steam. It feels natural to slip into cover and have the camera flick to a third-person view for some shooting action, but tiptoeing past security cameras and silently taking down enemies from behind are what make you really feel like a badass spy. The game's biggest issue arises a couple of hours in, when CounterSpy starts to pack more bad guys into the same amount of space. When there aren't many isolated enemies left to pick off without being detected, there's not much stealth to speak of--all that remains is a sub-par cover shooter. It's particularly problematic considering you can't aim at enemies in the background when not in cover, even though they have no problem emptying their clips into your face from the same angle. And when the levels inevitably get jam-packed, good cover options are increasingly limited, making the experience more frustrating than it is fun. CounterSpy is a cross-buy title, so you can also play it on your Vita, but I wouldn't recommend it. On the plus side, the entire game is intact, and your progress is recorded across all platforms. But the framerate hitches, and small analog sticks tend to make picking off headshots a frustrating chore. To top it off, the load times are significantly longer. Unless you like waiting, you're better off playing on a console. CounterSpy does have collectibles that unlock purchasable weapons and buffs, but even these don't do enough to help when you need an advantage during the stealth-breaking, late-game difficulty spikes. That's largely because many of these are geared towards aiding a sneaky approach, like the Silent Runner formula that allows you to move quickly and quietly, or the Sandman Sleeper tranquilizer gun that can put any guard down for a nap. The high-powered weapons that would help you thin out enemies aren't unlocked until after the first playthrough is finished. Even though you have to wait too long to buy the good stuff, there's a lot of fun to be had in searching for the collectibles, thanks to the procedurally generated maps. This includes the primary objective in CounterSpy, which is to find pieces of intel in order to access the game’s final mission. A few are scattered throughout each stage, and while none are actually required to finish a level, the final mission isn't playable until 25 pieces are collected. Even after unlocking the last stage, hopping back into another randomized level to scoop up more collectibles serves as an enjoyable sidenote, particularly in the early going when being stealthy is still viable. That endless stream of missions also comes in handy when you need to lower your DEFCON level, which puts a spin on the "limited lives" trope--with mixed results, depending on the stage of the game. If you're killed, spotted by a security camera, or allow an enemy to make an emergency call, your DEFCON level increases by one. If it's escalated beyond the highest level of DEFCON 1, you've got 60 seconds to reach the end of the stage before the moon-nuking missiles launch, or it's game over. But even if you start a stage at the lowest level of DEFCON 5, you can't get too cozy, as the DEFCON level persists from mission to mission. If you're careless, letting it escalate just makes your next stage more difficult. Conversely, purchasing the Persuasion formula or forcing an officer to surrender can lower the DEFCON level, and these options are crucial. I entered the final mission at DEFCON 2 and found myself failing repeatedly, but thanks to the continuous randomized stages, I could carefully play a couple of additional levels to work the DEFCON to a lower level, try again, and find success. Early on, it adds tension to the satisfying gameplay and gives you something to work towards other than collecting intel. It's also one of the only effective methods of difficulty balancing on higher skill levels, but at that late-game point, lowering it so you can move on just feels like grinding. The first few hours of CounterSpy are thrilling when there's an effective balance between stealth and action. It's a shame that the best part gets cut out when the sneakiness is replaced with cover-shooting. Even so, I can't deny the temptation to pick up and play another procedurally generated level with hopes of unlocking a new weapon or formula. But if I do, I'm not likely to re-enter the more difficult, stealth-less skill levels. You can throw a lot of enemies into a room and call a game hard, but it takes more than that to call it fun.